Collector's Editions Can "Pay Off in Spades"
"Collector's editions" of major videogames are growing increasingly impressive - and expensive - but the NPD Group says there's a good reason publishers keep releasing them: They bring in the money. 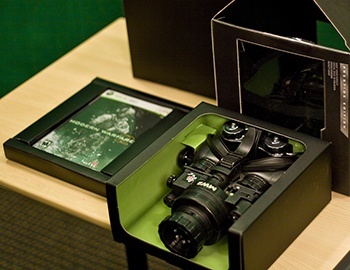 Remember when Activision unveiled the Modern Warfare 2 Prestige Edition, which included a fully-functioning set of night vision goggles? A lot of people claimed it was nuts, that it was too expensive, that nobody in their right mind would pay more than twice the cost of the standard release for a big box and a set of cheaply-made NVGs; and then, a few months later, a lot of people ran out and bought the thing. "Limited and Collector's editions of games have seen a steady increase in sales over the years, particularly in this hardware generation," David Riley of the NPD Group told Ars Technica. Sinking the money into the production of an expensive, limited edition isn't without risk, of course, but Riley said it can "pay off in spades." "It's not unusual for consumers to throw down the minimum payment on a preorder, end up not picking up the original preordered title and instead having that money applied to another preordered title," he said. "Often times, collector's editions that are bundled with additional products are only available via pre-orders. This helps to better guarantee the consumer will honor the preorder... so, if consumers don't pick up the bundled preorder, they lose the chance to have a collector's edition of the title." That last point is very valid: There's nothing that will get me in to preorder a game (and ensure that I'm there to pick it up) faster than the prospect of a limited edition. I eat that stuff up, and as digital distribution becomes increasingly prevalent, I expect to see even more of it in the future. In fact, with conventional retailers continuing to look for ways to stay relevant in the digital era, I wouldn't be surprised to see a return to the days when videogames included things like swizzle sticks, iron-on patches and microscopic space fleets as a matter of course. Man, that'd be awesome. Oh, and one other thing: Die-hard Modern Warfare fans who missed out on the $149 Prestige Edition can still pick them up on eBay - with prices starting at about 200 bucks. Hey, you had your chance.